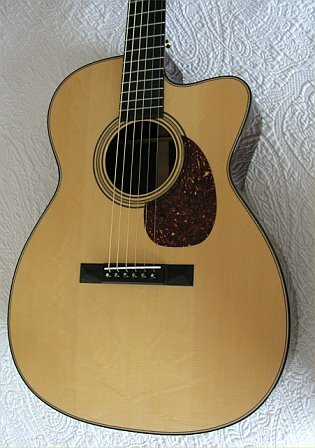 "In 2003 I brought a new guitar I had purchased which had a setup problem into TJ’s shop. He determined it was a structural issue, and after some time and effort I got the seller to take it back. Over the course of the resolution of that issue I talked to TJ about Schoenbergs and my long term desire to own one. I had done a workshop with Eric in 1996 and loved the guitar he was playing. At some point TJ remembered this one, and told me about it. 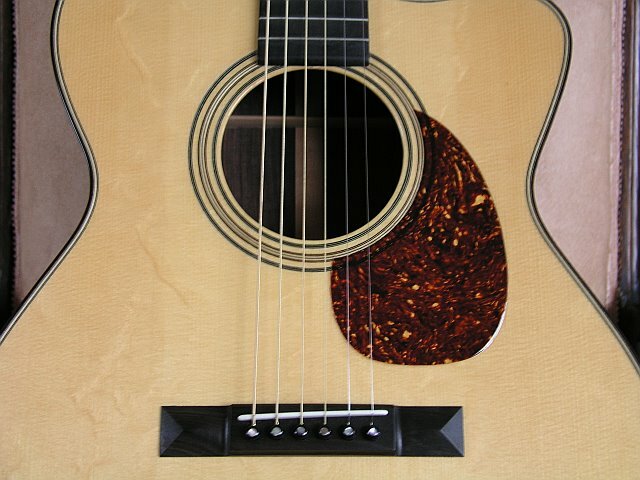 His memory is that it is Indian rosewood with an Adirondack spruce top. 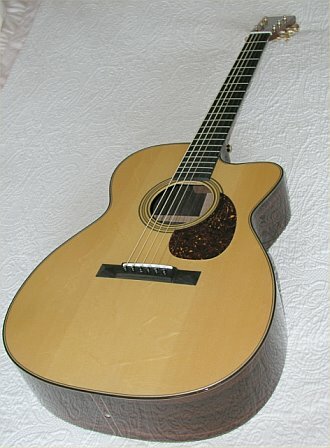 The guitar was basically built by Dana Bourgeois in 1989. 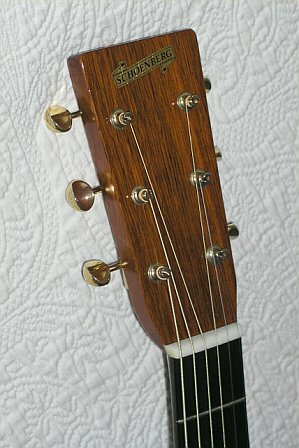 As with all Schoenbergs at the time, it was one of a batch sent to Martin for final finish and assembly. 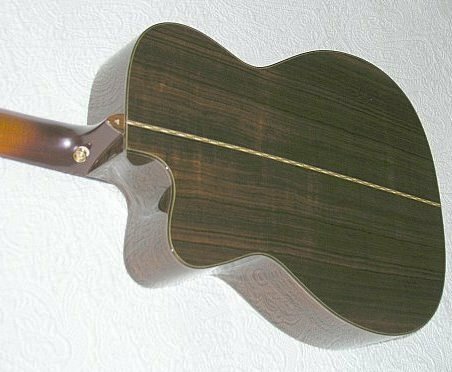 In doing finish sanding on this guitar, the Martin custom shop sanded through a portion of the inlay around the sound hole. The guitar and neck were boxed and sent back to Schoenberg unfinished. The box sat for a while, and Dana and Eric broke up their partnership. Eric entered into a new arrangement with TJ to continue to produce Schoenbergs on the same basis, eventually in TJ's shop in Concord. At some point TJ opened the box and remembered what had happened. 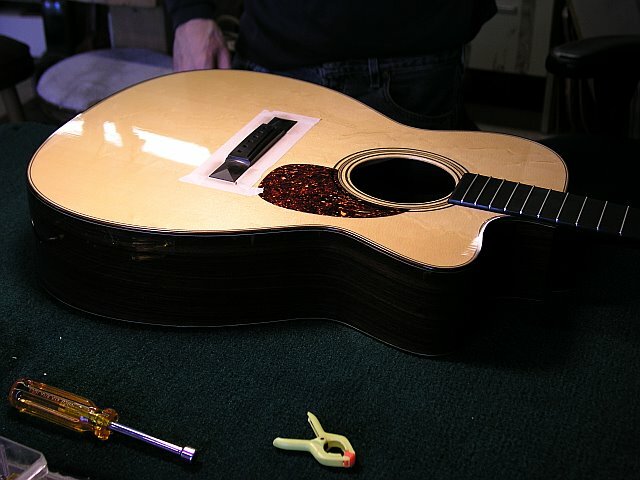 He re-did the inlay and sent it to a shop in Michigan for assembly and finish. The arrangement with Martin had come to an end by this time. The Michigan shop was one he had used when he was running repair and setup for Elderly. 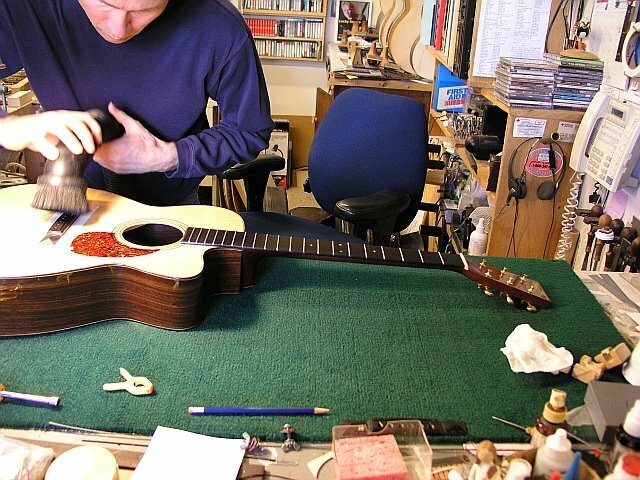 The guitar came back, but the finish had not been buffed out to TJ’s satisfaction. Again, it was set aside. Then he and Eric ended their relationship, and Eric moved his operation to the west coast. TJ forgot about the guitar until several years later when my conversations with him reminded him of it.